Is Gov. Greg Abbott a "member of the public," even when he's discussing government business? That's what he's arguing in order to keep his email address private. Those and other arguments in favor of government secrecy are leaving the public less and less informed, transparency experts say. Texas Gov. Greg Abbott recently added his voice to the Republican uproar over Hillary Clinton’s email scandal, congratulating a GOP presidential hopeful for saying foreign countries know more about her electronic communications than the U.S. Congress does. But Abbott, too, often uses a private email address for official government business, and in many years as a state elected official has often decided less is more when it comes to disclosing the communications. He has argued recently, for instance, that he is a "member of the public" in order to shield release of certain information, a tactic officially condoned last week by Attorney General Ken Paxton. In another case, Abbott calls the Texas governor’s office a “competitor” in the private marketplace in order to keep secret records related to taxpayer-funded incentives he’s offering private businesses — also with Paxton’s recently bestowed blessing. The governor's many redactions and unilateral decisions to withhold information — along with all the exceptions written into disclosure laws each year by the Texas Legislature — are leaving the public less and less informed about the activities of the government they pay for, transparency experts said. Abbott’s office did not return phone calls or emails seeking comment Monday. Paxton’s office pointed to the text of his legal determinations and declined to elaborate on the reasoning for them. Earlier this summer, Abbott provided dozens of emails in response to a Texas Tribune request for electronic communications from the day he was sworn in until the end of the last legislative session. 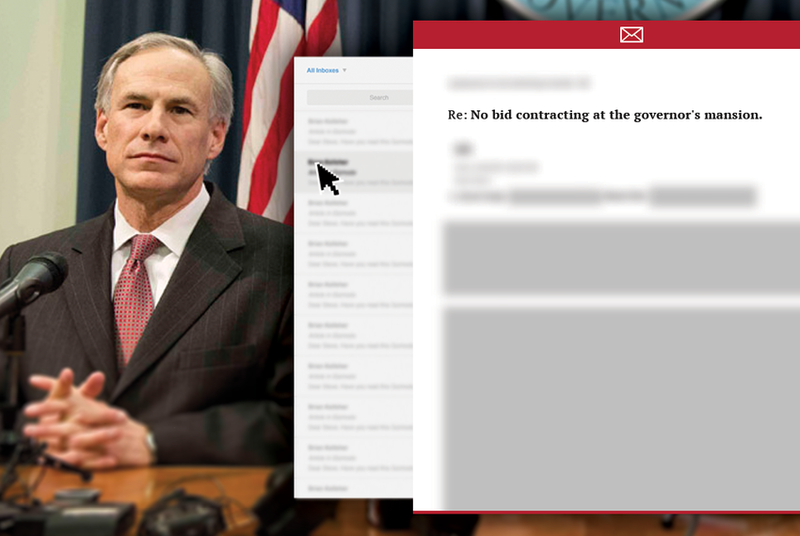 The emails gave the public a rare glimpse into how Abbott runs the governor's office. Though publicly seen as aloof and tight-lipped, behind the scenes Abbott comes across as highly interested in what the media thinks about him and a bit more shrewd and skeptical than his optimistic, straight-laced image might suggest. But the public remains in the dark about many of Abbott’s official dealings and major policy initiatives across state government — from public health to government contracting scandals. For example, Abbott provided the Tribune with a thank-you email from law professor and former Judge Scott McCown, named to a task force to help clean up the government contracting mess at the Health and Human Services Commission. But responses from Abbott and his chief of staff, Daniel Hodge, were blacked out. Likewise, a March 16 update to Hodge from former HHSC Commissioner Kyle Janek outlining the state’s readiness for an Ebola outbreak — coming on the heels of the state’s botched response to one last year — is so heavily redacted that it’s impossible to make heads or tails of it. HHSC is also seeking to withhold the email. Perhaps the most vivid example of the heavy redactions came in an email from Abbott to Hodge and Deputy Chief of Staff Robert Allen. 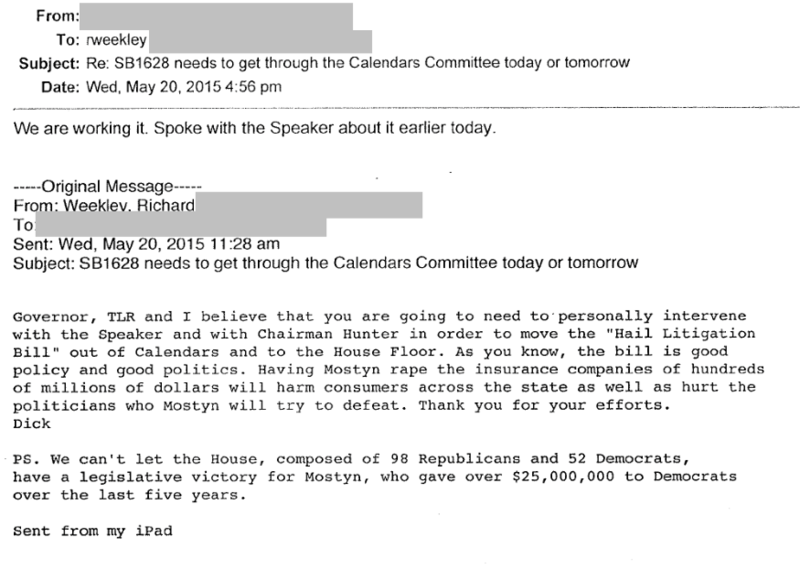 The subject line was “explanation of no bid contracting at mansion.” The rest of the long email was blacked out. The State Preservation Board, which maintains and oversees the Texas Governor’s Mansion, also turned down a request for documents related to any no bid contracting, or repairs and modifications at the mansion. The agency cited common law privacy, security concerns and broad protections of inter-agency discussions in its letter to the attorney general. In certain cases the law allows agencies to withhold records that are clearly not public information, such as Social Security numbers or credit card information. Generally, though, agencies ask the state attorney general to decide what can and cannot be released. In his objections to releasing various records to the Tribune, Abbott cited exceptions available under increasingly weak state transparency laws — from attorney client privilege to broad protections given to lawmaking deliberations — so it’s hard in many instances to tell which legal provisions triggered each redaction, or what types of records his office is refusing to provide. The two objections drawing the most criticism from transparency advocates relate to Abbott’s email address and his successful attempt to avoid scrutiny of his use of taxpayer money to encourage business relocation or expansion in Texas. That’s the exemption Abbott cited when his office unilaterally chose to block out identifying information in the address fields on emails provided by the governor’s office. Without that information included — or some explanation from the governor’s office — it’s impossible to say for sure if it was the governor himself who promised a top donor some last-minute assistance on a lawsuit-restriction bill that was stuck in committee last May. Somebody in his office did, albeit unsuccessfully. Several government transparency experts say the provision Abbott cites was never intended to protect the email addresses of public officials who are discussing state business inside the government. “I can’t see how a governmental official’s email address that he or she uses to conduct official business can be redacted,” said Joe Larsen, an open government attorney who also serves on the Freedom of Information Foundation of Texas. Larsen said the email address, like the body of the email itself, becomes a public record the minute it’s used for public business. Aleshire, an open records expert and attorney, is awaiting a decision on that very question in a lawsuit pitting an Austin watchdog publication, the Austin Bulldog, against the former Austin mayor and members of the City Council who have tried to withhold their email addresses using the same exemption. Aleshire is representing the Austin Bulldog. Abbott gets cameo treatment in the lawsuit, now pending at the 3rd Court of Appeals, because as attorney general he ruled that the city officials could keep their email addresses private. There are similar dynamics in the decision to withhold records about the state’s use of taxpayer-funded incentives to lure businesses to Texas. Abbott is citing an exemption he once extended to Perry, but experts say the provision was never intended to keep tax subsidy deals out of public view. That transparency exemption was included in the earliest iterations of the state’s Public Information Act to ensure the government — or a government contractor — doesn't get ripped off in competitive bidding situations. But in those cases government is trying to get the best deal for taxpayers, whether it’s buying computers or pencils, in the private marketplace. Abbott is arguing that the office of the governor has “specific marketplace interests” in recruiting companies to Texas with state tax dollars — as if he were putting out a bid for road construction. Paxton’s office agreed with the governor. “We find you have demonstrated the governor’s office has specific marketplace interests and may be considered a ‘competitor’ for purposes of" the state's open records laws, Paxton's office ruled. At the agency level the attorney general plays the role of umpire on government transparency issues, but the courts often have a different interpretation — and their word trumps his. Experts could not identify any past or upcoming rulings on Abbott’s move to extend transparency exemptions for competitive bidding in the private marketplace to the awarding of taxpayer subsidies.